Well nothing lasts forever and a few short weeks later the amaryllis was past its prime. The dried up flowers still looked kind of cool though, so rather than tossing them I salvaged the pretty petals for a dried flower arrangement. I plucked the dried petals and then twisted them together to form this cute little arrangement. This little vase that I picked up at the Christmas Tree Shops for under a buck is the perfect size to display the dried flowers. Since the petals shrunk as they dried, I made the arraignment look a little beefier by combining the petals from two past-due amaryllis plants. I’ve been displaying this dried arrangement for a few weeks and so far it’s been holding up well. It’s nice to extend the beauty of these pretty flowers a little longer. Do you have any tips for lengthening the life of flowers or displaying them once they’re past their prime? It’s no secret that I love the Golden Girls (in fact I’ve managed to somehow mention them in my blog posts here, here, and here); its only one of the best TV shows ever after all. Recently while I was watching a Golden Girls marathon, I got to thinking about what the Girls’ house would look like if the show took place today. Back in the 80s and early 90s when the show aired, The Golden Girls Miami house was decorated in wicker and pastel floral prints. -Banana Settee & Armchair: I kept the wicker look, but modernized it with a sofa and chair made of banana bark and mahogany. 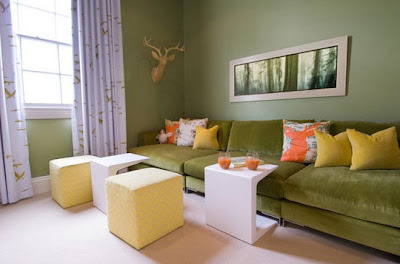 -Accent Pillows (Yellow , Blue & Pink): Instead of floral furniture, I think floral pillows are a fun updated look. -Klubbo Coffee Table: I kept the square coffee table shape, but updated it from wicker to wood. -Blue Vase : This vase brings in some of the traditional elements the Girls had in their living room. -Eat, Pray, Love Book : As a substitute English teacher, Dorothy loved reading. I can picture the girls curled up on their new sofa with a good book like this. -Glass End Table : The end table is still glass but with contemporary metal accents rather than brass. -Sea Glass Lamp: To bring in some pastel and tropical colors, I added this sea inspired lamp. -Lacquer Floor Vase & Willow Branches: The turquoise blue color is continued into this fun floor vase. 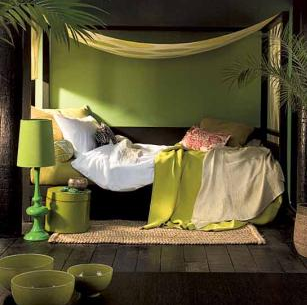 -Potted Plant: Plants never go out of style and this tropical beauty has a Miami vibe. -Sea Flower Blue Print: Their art has been updated too but keeps it pretty pastel colors and continues the tropical vibe. So what do you think of my take on The Golden Girl’s updated decor? 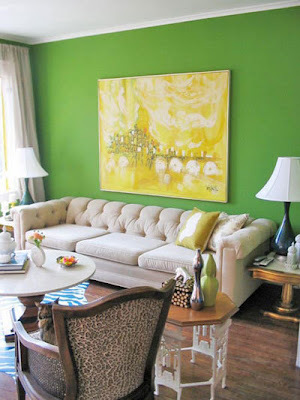 Can you picture Sophia, Dorothy, Rose, and Blanche hanging out in this living room? Psstt…I’m thinking about making this a regular feature on my blog. What old tv show houses would you like to see modernized? 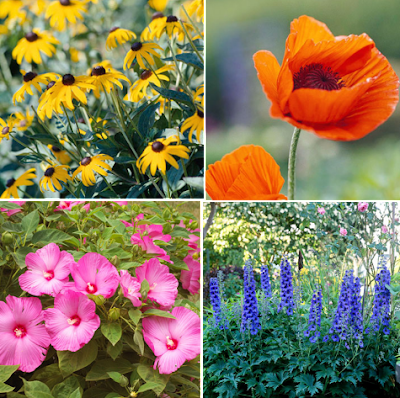 Do you have experience with any of these flowers? I'm still a novice gardener so any tips would be appreciated! 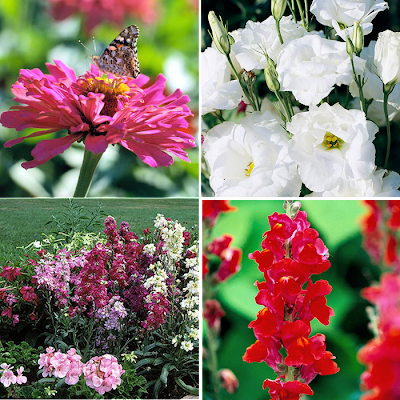 What flowers will you be growing this year? If you want to join in the fun, sign up for Plum District and then refer 4 friends to get a $20 Target gift card! 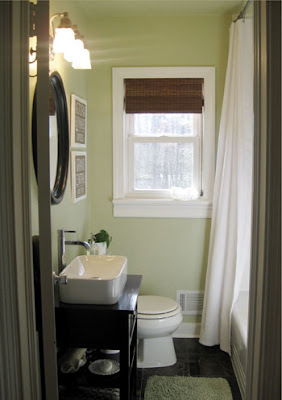 With the bathroom tiling project that's currently underway in our house, bathroom renovations are definitely on my mind so I was excited to read about the top 2011 bathroom trends. 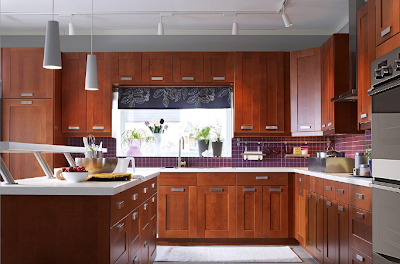 The National Kitchen & Bath Association, an association of professional kitchen and bath designers, published a list of the top 2011 kitchen and bath trends (you can read about the top 2011 kitchen trends here). Now, time to check out the top bathroom trends. 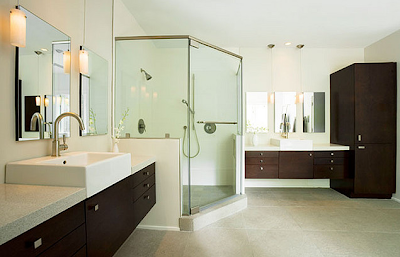 Granite is still the top bathroom countertop choice, but quartz is gaining in popularity. 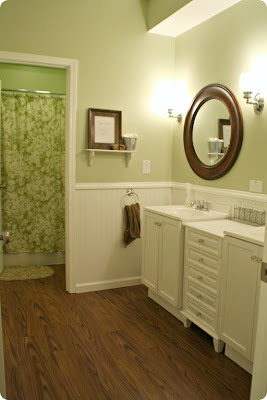 Green is the new "it" color for bathrooms. Although white, off-white, beige, and brown are still the top choices, brown and beige are becoming less popular while green is increasing in popularity. Under mount bathroom sinks are the most popular sink choice, but vessel sinks are gaining in popularity. 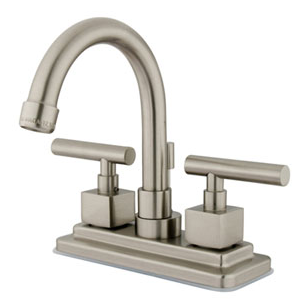 Satin nickel finish faucets are a hot trend for both bathroom and kitchen faucets, out-doing their brushed nickel cousins. 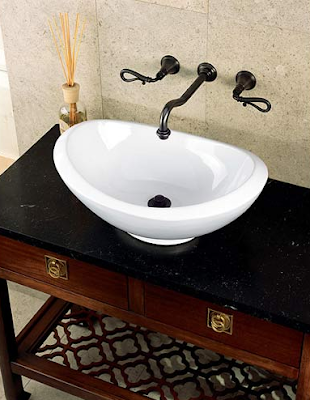 Bronze, oil-rubbed bronzed, polished chrome, and polished nickel are other popular bathroom faucet choices. Do you agree with this year's top bathroom trends? I've been thinking about painting my kitchen cabinets white for months, but it turns out white cabinets aren't the hot trend anymore! 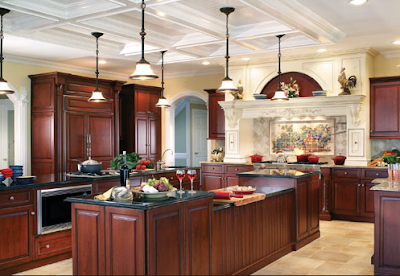 The National Kitchen & Bath Association (NKBA) has released their list of 2011 kitchen trends. They polled over 100 designers to see what kitchen trends they were using for their customers and what they expect to be popular in 2011. 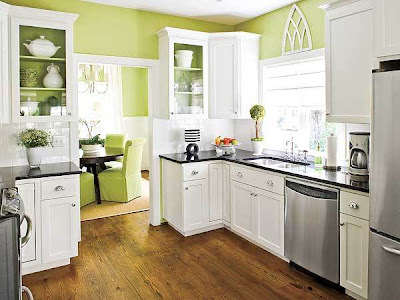 Traditional style kitchen cabinets are still the most popular, but Shaker style cabinets had a big rise in popularity in 2010 and are now the second most popular style. 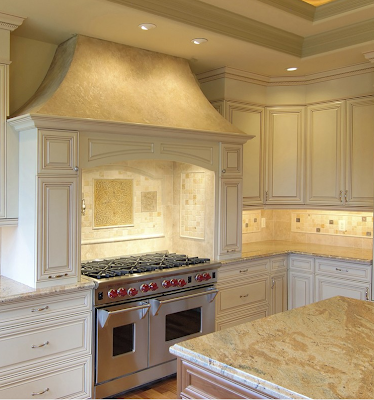 Look for this style of kitchen cabinetry to keep gaining popularity. Here I am still dreaming of a bright white kitchen, but it turns out dark natural cabinet finishes are now more popular than medium natural, glazed, or white painted cabinet finishes. Wine refrigerators dipped in popularity, but unchilled wine storage in the kitchen is becoming more popular. Other built in kitchen features like tall pantries, lazy Susans, and pull-out racks are all still super popular, but declined in popularity in 2010. 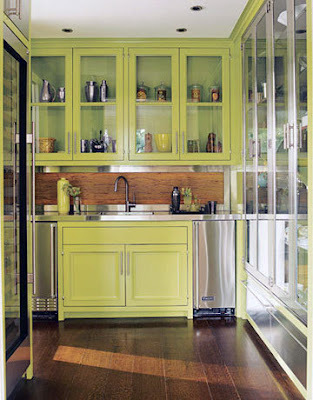 I haven't seen very many French door refrigerators in homes yet, but look for this to keep gaining popularity. 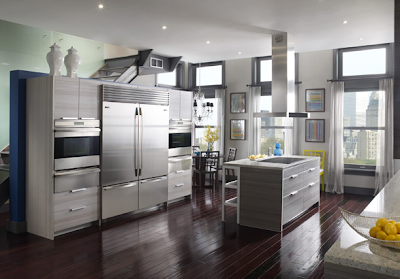 Among the NKBA designers, French door fridges are the most popular. 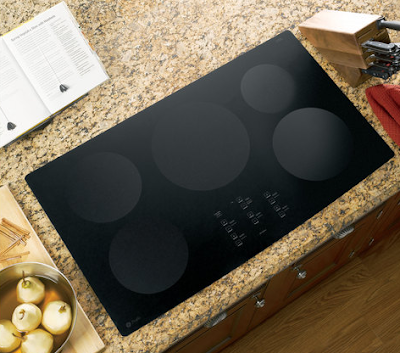 Gas and electric cooktops are still the most popular, but induction cooktops are gaining in popularity. Designers are choosing energy efficient LED lighting more and more over traditional incandescent lighting. 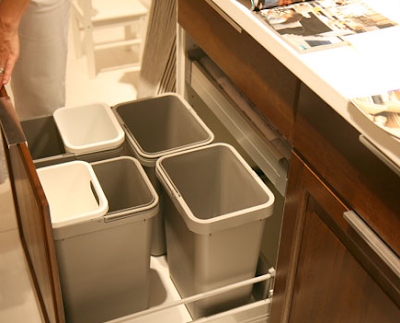 Under cabinet and pull-out trash and recycling containers have also gained in popularity. I'm all for this trend, my kitchen trash can is out on display and I always wish I had space in the kitchen to hide it away. 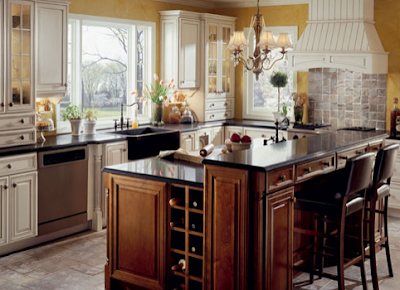 So those are the top 7 kitchen trends to watch out for in 2011, according to the National Kitchen & Bath Association. It's fun to be the one with the newest hottest trend, but when it comes to the kitchen (and the hefty price tag that usually comes with kitchen upgrades) I personally prefer a classic look that will be in style for a long time. Do you agree with these top kitchen trends? 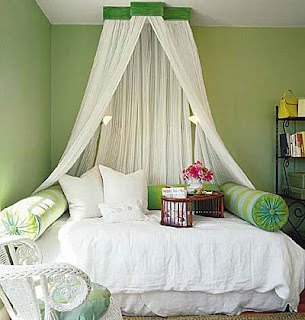 Do you like having the newest trend in your home or are you like me and prefer the tried and true? No, we don't have our hands in the air like our pup when he's been caught causing trouble. We're just sticking our new tiles to the walls in our bathroom. We've been on tile duty working on our latest project, adding accent tiles around our master bath. When I last left you, we ripped down our old boring beige tiles and patched up the drywall behind them to prepare for the new tiles. Now it's time for the fun stuff: installing the shiny new glass mosaic tiles! 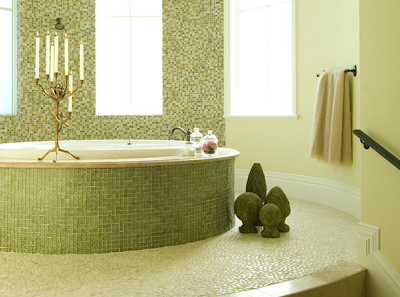 The great thing about working with mosaic tiles is that little or no tile cutting is involved. These tiles come in squares of 15 tiles by 15 tiles, attached by a net backing. We wanted our bathtub border to be just 6 little tiles tall, instead of the 15 that come per sheet, so we simply cut the backing with a pair of scissors to get just the right amount of tiles for us. Easy peasy and we didn't even have to borrow my Dad's tile saw! So once our tiles were all trimmed, it was time to actually stickem' to the wall. Back when we installed our kitchen backsplash, we learned that sometimes the easy route is the better route so we chose a pre-mixed tile adhesive. Yes, it's pricier than old school adhesive which you have to mix yourself, but its also a heck of a lot easier. No mixing is required, the adhesive is ready to use right out of the tub. Starting in the corner of the walls and working in small chuncks, I spread a thick layer of adhesive onto the walls using a wide putty knife and then ran across it with a notched trowel to ensure we had an even coat on the wall. It was a lot like frosting a cake. Once there was a nice level coat of adhesive of the wall, I placed the tiles on the wall making sure they were being placed at a level height. You can see my trusty leveler below which I used to make sure that the tiles were being placed on a nice even line. Then I repeated the process section by section until all of the tile went up. As I went along, I used a big sponge to wipe off any excess adhesive that got on the front of the tiles. It's looking better already, but of course we aren't done yet. Our next step is to grout the tiles. We might not get to grouting until next weekend, but I'll be sure to share an update as soon as it happens! He loved the tiles and surprised me by bringing it home for an impromptu tiling project! Don’t hate me, but I may just have the best husband ever! He thought that this tile would look great around the perimeter of our soaking bathtub in our master bathroom. We have a pretty boring builder's grade master bath and this tile could add a little jazz to the room without spending a lot of money (which is great for resale down the line as bathrooms are always important to buyers). I totally agreed and was right on board! Unfortunately, we didn't snap a good "before" picture, but here's one we took several years ago when we first bought the house (notice since then we painted the top of the ledge white, but never fully repainted the room). So once we were both on board with re-tiling, the first step was to remove the old boring beige tiles surrounding the tub. Rob got fast at work using a hammer and that little chisel type tool in the photo below to take down the old tiles. However, as the tiles came down, parts of the drywall came with it. And then he fixed it by cutting a square of new drywall, hammering it in, and patching it up with joint compound. Once the walls were patched, it was onto the fun stuff- tiling! I'll share another update soon as we complete more of the tiling (it's still a work in progress)!